As I was going through my recent posts I realized that I talked about our Eastern European trip only briefly. I mentioned how awesome Budapest was and how getting back into the groove of working sucked, but never mentioned the time we spent with my parents in Romania, or the Tokaj trip we took with my friends from Hungary. So many stories come to my mind that I'm having a hard time choosing one to start with. Although the wine tasting in Tokaj happened earlier on our vacation I’ll talk about it in a future post as I feel like the road trip with my parents is more relevant to this recipe. As I mentioned before, Roni and I spent an entire week with my parents doing a road trip from my home town of Satu Mare to the spectacular Transfagarasan road, also known as Ceausescu's folly. We drove through Turda and Cluj and stopped for a night each in Sibiu, Bran and Timisoara. It was probably the most time I have spent with my parents since I was a teenager. It felt so good bonding again, sharing funny stories and just spending time together. It reminded me of my childhood when my dad used to take me on his business trips around Romania. It was fascinating to see in person the mountains, rivers, gorges and lakes that I read about in books or learned in my geography class. Because of my father’s fear of flying, he’d always choose to drive even though it sometimes took him days to get to places. We would drive on these crazy winding roads in the Carpathian Mountains and admire the scenery on the Danube’s Canyon Road as we passed the Iron Gates gorge. It was insane! I wanted Roni to experience all the emotions that I experienced as a kid. I wanted her to see how breathtaking and beautiful my country is. And she did- she was amazed by its beauty, simplicity and hospitality. It was a lot of fun, but also frustrating at times mostly because of my father, who has a really unique way of doing road trips and sightseeing. In my father’s book, a road trip is to drive from a starting point A to a final destination B with minimal stops in between. Stops are only allowed when the gas is running low or the driver (in this case, my dad) had to use the restroom. No other events are important enough to warrant a stop. Also, there are priority levels when it comes to restroom stops. Roni and I found out that we were in the lowest possible bracket when it took my dad an hour and several passed gas stations to finally stop so we could use the restroom. He’d either “forget” about the much needed bathroom break or find the gas stations to be not up to his standards. It was comical in many ways but it took a lot effort on both my father and my side not to get in an argument. Fortunately, my mom was there to bring peace and harmony when it was needed. Overall the road trip was superb. We saw everything we planned to see and more. The most memorable sights were the colorful trees along the Transfagarasan road, the charming city of Sibiu with its many cute cafés, the Bran Castle (aka Dracula’s Castle), and the pleskavita (Serbian burger) I ate in Timisoara, my college town, that took me back to the good old days. Romania is absolutely beautiful, a fairy tale-like place where time seems to have stopped. It is a rough uncut diamond that will shine again, once the new generation of young intellectuals will bring a much-needed change in mentality. I’ve had this recipe in the queue for quite sometime now, but until now I didn’t find the right opportunity to post it. Cauliflower has always been our family's favorite vegetable, even though my father would argue with that. My mom Rodica, makes a killer cauliflower soup as well as cauliflower soufflé, fried cauliflower and even a cauliflower spread. This recipe is very close to my mom's, although she doesn't add sautéed onions and garlic to hers. She also separates the egg whites from the yolks and beats them. I guess that would be the proper way of making a soufflé, but the minimal difference in flavor and texture doesn’t justify the effort in my opinion. Pofta buna! Fill a large pot halfway up with water and one tablespoon salt. Bring it to a boil over high heat. Add cauliflower florets and cook for about 15-20 minutes, or until they can be pierced with a knife (al dente). In the meantime, in a bowl combine breadcrumbs, parmesan, paprika and 1/2 tsp kosher salt. Using a fork, whisk them together. Coat the bottom and sides of a 9"x5" deep baking pan with a tablespoon butter. Pour in half the breadcrumb mixture and shake the pan to create an even layer on the bottom. Some crumbs will stick to the sides of the pan as well. Drain the cauliflower, set aside and let it cool. In a medium sized sauce pan, heat the remaining 2 tablespoons of butter over medium heat. When it starts to foam add the shallots, stir and cook for 3-4 minutes. Add the garlic, nutmeg, white pepper and chili flakes and continue cooking for another 3 minutes, stirring occasionally. Pour in 1/3 cup milk, raise the heat to high and bring to a boil, about 3 minutes. Remove the sauce from the heat and set aside to let it cool down. In a large bowl, crack the eggs open and beat them until they become foamy. Add the rest of the milk, 3/4 cup gouda cheese, black pepper and a pinch of salt. Using a whisk mix them together. Add the cauliflower to the egg mixture and slowly mix in the milk and shallot concoction. Pour egg and cauliflower mix into the baking pan. Sprinkle the top with the rest of the breadcrumbs and gouda. I usually grate some parmesan as well for that nutty flavor. Place the pan in the oven and bake for 30 minutes. Raise the temperature to 420F (215C) and cook for another 10-15 minutes or until the top of the soufflé is golden brown. Remove from the oven and let it cool a bit before serving. Cut into inch thick slices. Serve as is or for an extra zing, sprinkle with fresh lemon juice and smoked paprika. Fish cakes are pretty new to me. I started making them about a year ago with this combination of flaky fish and smooth and rich cauliflower being my favorite. I was introduced to fish cakes by a chef whose name I can't recall, but let's call him Juan. I worked with him in Virginia during mycollege years when I waited tables at a restaurant called Blue Water Grill during the summer. Juan was really good at preparing fish and seafood and according to him fish cakes and crab cakes were his specialty. I was in Virginia on an inter-exchange program for students lucky and brave enough to fly across the ocean into the unknown to experience the American Dream. It was the summer of 2006, the second summer I spent in the U.S. I started my American journey that summer as a lifeguard, but soon after I decided to quit that job and start waiting tables instead. It was a good way to practice and improve my English and it also gave me the opportunity to interact with people. The most appealing part to me was that I got to be close to a professional kitchen where I could watch and learn from the line cooks and chefs. I loved working there even though it got pretty wild and rough sometimes. If you’re not familiar with professional cooking, Anthony Bourdain describes his experience as a cook in Kitchen Confidential (I highly recommend reading this book) and his descriptions basically hold true in any restaurant kitchen in the U.S. Obscene and abusive language, salty chefs, waiters that screw up orders, drinking and eating at work are all part of your every day life in the restaurant industry. I fell in love with it after those few months and when I returned to Romania in the fall to continue my studies, I really missed all the people that I worked and bonded with. In the past, fish cakes were seen as an easy way to incorporate leftover fish that otherwise would've been thrown away. The most common fish used is still cod, but other white flakey fish like haddock or pollock can be used to achieve similar flavor and texture. The potatoes and eggs are the binding elements, while also adding some texture and creaminess to the cakes in the process. I choose to add cauliflower as well, not only because cauliflower is delicious and nutritious, but also because of Roni's habit of sneaking a cauliflower in our cart while grocery shopping. One thing that it's worth mentioning about this dish is that it will leave a stink in the house that would hang around for hours. The flavor and taste of the dish is in total contradiction with its smell, but, you know, I care for my readers and want them to return to my blog, not curse my cauliflower fish cakes for turning their house into a fart fort. So in case you were trying to find a dish to impress and cook for your date, maybe look for something else until you get a bit closer and more comfortable around each other. As my father used to say only cauliflower and farts smell like farts. One of the most important things to keep in mind when making fish cakes is that you have to place them in hot oil. Really hot oil. If you don't the fish cakes will be soggy and greasy instead of crunchy on the outside and creamy on the inside. I usually serve them as a main dish with a salad or even on a bun as a fish burger, but you can make them smaller and serve them as appetizers. No matter how and when you serve them, this dish is going to be a definite conversation piece. As for the chili-lime yogurt sauce, it adds that tangy and refreshing element that the sweet and rich fish cake is lacking. Enjoy! Fill a large pot halfway up with water. Add cauliflower, potato, and a tablespoon of salt and bring to a boil over medium-high heat. 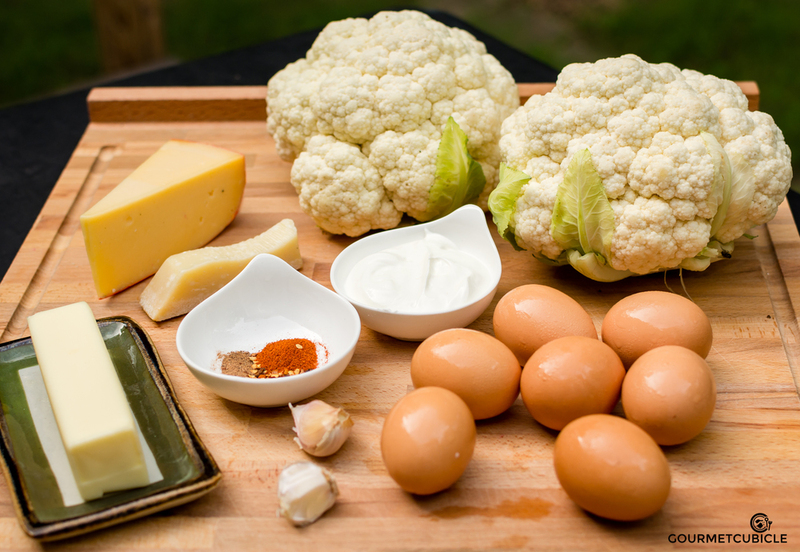 Cook until the cauliflower can be easily pierced with the tip of a pairing knife, about 20-25 minutes. While the cauliflower and potato are cooking poach the fish. In a large saucepan combine water, broth, wine, thyme, garlic, salt, and black pepper. Bring to a boil over medium-high heat. Add fish fillets, reduce the heat to medium-low, cover the sauce pan and let the fish poach for no more than 5 minutes. In the meantime, in a small bowl mix all the ingredients under chili-lime sauce. Stir well until the ingredients are mixed well. Cover with a plastic wrap and place it the refrigerator. Remove fish from the pan using a sieve or a slotted spoon. Drain, discard the juice and let the fish cool. Once cold, break the fillets into small chunks. Drain the cauliflower and potato and let them cool for about 5 minutes. Place them in a food processor, pulse them a few times into small chunks. Do not overdo it, as you don't want them mashed, but chunky. Transfer the crushed cauliflower to a large mixing bowl. Add fish, eggs, shallots, salt, pepper, parsley and breadcrumbs. Using a spatula or wooden spoon stir well until you get a mixture that can easily molded. If the mixture is too sticky, add another tablespoon or two of breadcrumbs. Pour in olive oil, give it another stir and let it sit for 5-10 minutes. Divide mixture into 8-10 equal parts. Shape and pat hockey puck-sized discs, about 3 inches in diameter and 3/4 inches in thickness. You can sprinkle more breadcrumbs on each patty if you like fish cakes to be extra crispy. Heat oil in a large non-stick frying pan over medium-high heat. When the oil is sizzling hot (easily slides across the pan) carefully place the fish cakes in the pan. Fry patties for 2 minutes, or until dark golden brown. Flip on the other side, cook for another 2 minutes. Transfer fish cakes from the frying pan to a paper towel lined plate or a wire rack. Serve fish cakes freshly fried and hot with a side of chili-lime sauce and a wedge of lemon or lime. Before placing the fish cakes in the frying pan make sure the oil is really hot, otherwise the fishcakes will be greasy and soggy. To check if the oil is hot enough drop a few breadcrumbs in the pan. If the oil starts sizzling, you're good to go. Don't overcrowd the pan with fish cakes. You risk reducing the heat in the pan to the point where the fish cakes will not brown and will become greasy. Instead, work in batches or 2-3 patties. The fish cakes will keep in the refrigerator for no more than a couple of days. They also freeze well and keep for about a month in the freezer. I recommend that you eat them right after frying them as they don't reheat well. A few weeks ago I was asked to participate in a curry cook-off fundraiser through which my dear friends Antonio and Nicole from Science in a Suitcase were raising money for volunteers to go on a trip to Dindigul, Tamil Nadu, India. Their organization sends engineer volunteers to third-world countries to expose children to science. I got to know Nicole and Antonio through my job, but we really got to be friends when earlier this year I volunteered for them in Siem Riep, Cambodia teaching elementary school kids Lego Robotics. I spent three days at a local school teaching with legos and building cool stuff like motorized tuk-tuks and boats with a group of super shy yet creative kids. Even though it was exhausting spending 8-10 hours in a hot classroom with no A/C, it was so rewarding. It felt so good to share my passion for science and engineering with such a bright and eager group--they even came to school on a Saturday just so they could spend an extra day learning from me. Education isn't a given in that part of the world, and children don't take it for granted like is often the case here at home. The trip to Cambodia wasn't work-related though. Everything was organized by my amazing girlfriend Roni, who singlehandedly made all the arrangements to make sure we had a great time there. I haven't mentioned it yet here, but Roni has a social business called krama wheel that empowers women in Cambodia to work from home and help kids get access to education: for each handmade scarf or beach throw sold she donates a school uniform to a child in need. If you aren't familiar with recent Cambodian history, in the late 70's during the Khmer Rouge regime under the leadership of Pol Pot, over 25% (2-3 million out of 8 million people) of Cambodia's population was executed or died in forced labor camps due to strenuous working conditions, malnutrition and lack of medical care. Most of the victims were intellectuals ranging from doctors to teachers. Pol Pot's idea was to create an agrarian socialist country where only peasants were needed. According to his calculation, to achieve this utopia he needed only one or two million people. The effects of those horrible crimes are still noticeable in Cambodia. Literacy and education rates are low and poverty is peaking. On this trip I had the chance to experience what fuels Roni's drive to succeed with krama wheel. She took me to some of the most isolated villages in rural Cambodia where families cannot afford to send their children to school for various reasons, one common one being that they don't have the funds to buy school uniforms (which are mandatory), another being that families require their children to help in the fields to ensure a successful harvest to make ends meet. I come from a poor country and lived under the communist regime of Ceausescu. I know what is it like to have meager food rations. I know what is it like to have no freedom of speech, to live in fear of the secret police agency (Securitatea). It was bad, but at least I had access to education. Education is what helped me be the person I am today. That's why I feel so strongly about education and wanting to help others in need. I truly feel that education is the most powerful tool for changing the world. As for the curry, I didn't win the cook-off. An absolutely amazing lamb curry came in first and a duck curry in second. Mine was one of the top-voted among the vegetarian curries and I received praises by many of my Indian co-workers, which honestly made me feel more honored than any award could. The vegetable list in the recipe is pretty extensive. I added so many, because I had to cook for 8-10 people, but you can opt to add less. Enjoy! In a bowl combine coconut milk, yogurt and tomato paste. Whisk until all ingredients are combined. Let the mixture sit at room temperature while you proceed with the rest of the recipe. In a food processor mix all the ingredients under paste. Pulse until you reach a smooth consistency. Set aside. In a large deep stainless steel skillet heat one tablespoon ghee over medium-high heat. When it melts and starts smoking add all spices under the tempering section. Toast until mustard seeds start to pop and spices become aromatic, about 1 minute. At this point you can remove and discard the larger spices (cloves, anise, cardamom, bay leaves, fenugreek seeds) if you'd like, as the spices already released their aromatic oils. Add the rest of the ghee, let it melt and then mix in onions. Sauté for 5-7 minutes until onions are translucent. Pour in the paste mixture and cook until it thickens, about 10 minutes. Add turmeric, chili, coriander powder, and one tablespoon salt. Stir well. Add sweet potatoes (do not add the regular potatoes yet, if using), carrots, eggplant and cauliflower. Pour in the veggie broth and bring to a boil. Lower the heat to medium, cover with a lid and cook for 10-15 minutes until the vegetables are tender, but not mushy. Remember that you'll cook them more so don't overcook them. Meanwhile, in a bowl combine one teaspoon oil, paneer cubes, coriander, turmeric and chili powder. Mix well until the paneer is evenly coated. In a non stick pan heat the rest of oil (2 teaspoons) over medium heat. When the oil is hot and it easily slides across the pan, add paneer cubes. Cook until golden brown on each side, about 5-10 minutes. When done, sprinkle with salt, transfer the paneer to a plate and set aside. Return to the large skillet. Temper the coconut and yogurt mixture by transferring one ladle at a time of the hot curry into the mixing bowl. Once tempered, pour the mixture into the skillet, and stir to combine. Add potatoes, beans, chickpeas and paneer and cook for another 8-10 minutes. Taste and adjust saltiness. Chances are that the curry will need a lot more salt. Remove from heat, sprinkle with cilantro and more cashews if you'd like. Some of the spices used for tempering are unpleasant to bite into. I personally don't mind them (except for the fenugreek which is very bitter) and usually just leave them all in the curry and remove them when eating. Alternatively you can use a tea ball for the more intense spices after you toasted them. Don't be surprised by the amount of salt you'll need to use. It's normal when working with vegetables. Serve hot over basmati rice or with naan bread with a side of raita. Not even a month has passed since I posted my last cauliflower recipe. Last time it was the creamy and flavorful cauliflower risotto with schnitzel, now it's the fragrant roasted cauliflower and crispy chickpeas inspired by middle eastern cuisine. If you like this amazing and underrated vegetable, you're in the right place. Chances are that it will be the most featured vegetable on the blog, not only because of my endless love for cauliflower, but also because of Roni. As mentioned in my previous post, Roni has this habit of sneaking cauliflower in our shopping cart every time we go grocery shopping. And we go once a week. On top of that, our local CSA also included a few of them in our recent delivery. At this pace, I'm afraid I'll run out of ideas for recipes before the end of the year. My mom used to cook cauliflower a lot. It was very easy to grow, which meant that my grandfather, Bunu, would always have them in his garden. Luckily it isn't green like broccoli so it didn't scare me and my sister away from eating it when we were kids. My mom would take advantage our our fondness for cauliflower and get creative by making cauliflower soup, roasted cauliflower, fried cauliflower, cauliflower soufflé or even mashed cauliflower. And we'd eat it all without thinking twice. I find that often people who eat something in huge quantities as kids will start hating that taste so much that when they grow up they lose interest in it completely. It was the opposite for me with cauliflower. Its taste reminds me of my mom. It reminds me of the good old days when I would hang around the kitchen while she cooked. My dad on the other hand is not the biggest fan of cauliflower, so you can imagine the joy he had when we kept requesting it. He says that boiled cauliflower smells like fart. I think I will have to agree with him on that one, but cheeses smell bad too sometimes, but the taste compensates for the aroma. One thing must be know about my dad- he has a very sensitive nose. I remember that one time while I was in high school I went to France with a friend of mine to a small town near the Swiss border called Besançon. My mom asked me to bring her back some cheeses. I brought home Camembert, Roquefort, Brie de Meaux, Époisses de Bourgogne and a few others. When my dad entered the house, he immediately turned around, refused to come back in and told us that we had to choose which stayed, him or the cheeses. And he wasn't joking. So we took all the goodies to my grandparents' place and had a huge cheese feast with fresh bread, honey and homemade jams. The ingredients in this recipe shouldn't scare you away from trying it. I was intimidated at first by all the new spices and ingredients that I had access to in the US, but after a few failed attempts, I managed to get a good understanding of the flavors and uses. Don't be afraid to experiment with new flavors. You may discover a new favorite that you’ll wonder how you ever lived without it! A few years ago, if you had asked me if I liked barberries I would've said, “Hell yeah!”— not because I actually knew what they were (I’m stubborn and likely wouldn’t have admitted not knowing that word anyway), but mostly because it had the word berries in its name, and I love me some berries. Barberries are truly amazing. They are specific to Persian cuisine where they are mostly used in rice and couscous, or served with chicken. You may find them under the name of zereshk at Persian or Middle Eastern stores. They bring a burst of color and an explosion of tartness to your dishes. I chose to add them to this recipe because their tangy and lemony flavor contrast well with the nuttiness of the chickpeas and tahini. If you can't find them anywhere, worry not, replace them with dried red currants or dried sour cherries. Preheat oven to 425F (225C). Trim the leaves off the cauliflower and remove the stalk. The cauliflower will naturally fall apart into large florets. Cut these into small florets. Drain chickpeas and pat them dry with a paper towel. Soak barberries in warm water and set aside. Combine turmeric, cardamom, coriander, cinnamon, black pepper and curry leaves together. Add cauliflower florets, chickpeas, olive oil, and curry spice mix to a large mixing bowl. Toss well and make sure the cauliflower and chickpeas are evenly coated with spices and oil. Transfer the cauliflower and chickpea mix to a parchment paper lined baking sheet. Spread it out evenly and sprinkle smoked paprika on top. Don't go too crazy with the paprika though. If burned, paprika becomes bitter. Put the sheet in the oven and let it roast for about 35-40 minutes. Make sure that you toss it every now and then so that the cauliflower browns evenly and the chickpeas don't burn. In the meantime, combine raw tahini, white pepper and lemon juice in a medium mixing bowl. Whisk well. Don't be alarmed if the lemon juice will make your tahini thick and lumpy. Keep whisking and start adding cold water until the sauce becomes smooth and silky. You can adjust the consistency of the sauce by adding more water. If you prefer a really thick sauce reduce the amount of water mentioned in the recipe. Toss in the chopped mint, taste and adjust the saltiness. Remove the chickpeas and cauliflower from the oven and transfer the mix to a large bowl. Squeeze water out of the barberries and add it to the mix. Squeeze half a lemon, sprinkle chopped mint and grate parmesan on top. Add salt, taste and adjust seasoning. Serve with the tahini either drizzled on top or on the side in a dipping bowl. Enjoy!